At a recent hydraulic maintenance workshop, I was asked for my opinion on isolation valves on pump intake lines and whether a more expensive ball valve is mandatory as opposed to the generally cheaper butterfly type. At the root of this question is the negative effect of turbulence in the pump intake line. The argument for using a ball valve as an intake-line isolation valve is that when it’s open, the full bore of the valve is available for oil flow. So if you have a 2-inch ball valve installed in a 2-inch intake line, when the valve is open, it’s as if it isn’t there at all (from the oil’s point of view at least). On the other hand, a butterfly valve is not full bore. Even when fully open, the butterfly remains in the bore and presents a partial restriction, which is irregular in shape. This causes turbulence, which can result in dissolved air coming out of solution in the intake line. If this happens, these air bubbles will collapse when exposed to pressure at the pump outlet. In other words, a butterfly valve may cause gaseous cavitation. So which is best: a ball or butterfly valve? Well, like a lot of issues in hydraulics, it depends. In a perfect world, I would always choose a ball valve ahead of a butterfly valve. For intake-line diameters up to 3 inches, there’s virtually no cost penalty involved in doing so. However, when you get into 4-, 6- and 8-inch diameters, ball valves are very expensive in comparison to their butterfly counterparts. They also take up a lot more space, particularly in overall length. So in a mobile application, for example, not only may the cost of a large-diameter ball valve be prohibitive, but there also may not be enough space between the tank outlet and the pump inlet to install it. The pump can never be started with the intake isolation valve closed. There is a third alternative. Many people wrongly believe intake-line isolation valves are essential, when in reality they are not, but for a few exceptions. The first question that pops up in response to this is how can the pump be changed out if there is no isolation valve on the intake line. There are two answers to this. First, if the pump has failed catastrophically and you are doing things “right,” the oil should be pumped out of the tank using a filter cart and into clean drums or other suitable container. Then the tank should be thoroughly cleaned, the pump changed out, and the oil (assuming it is still serviceable) pumped back into the tank using a filter cart. The common objections to this are: “Oh, we don’t have time for that!” or “We don’t have 10, 20 or however many clean drums sitting around.” A work-around for those who don’t want to do the job right is to cap all penetrations into the tank headspace and connect an industrial vacuum cleaner to the tank breather penetration. Switch on the vacuum cleaner while the pump is changed out, and then when the debris from the previous pump failure causes the replacement pump to fail, repeat the exercise. Of course, there are exceptions, such as if there’s more than one pump sucking from the same tank or it’s just not practical to pump say 3,000 gallons of oil out of the tank. Sometimes intake-line isolation valves are a necessity. If this is the case, it’s wise to make sure they have proximity switches to prevent the pump(s) from being started when the valve(s) are closed. My preferred approach is to fit neither ball valve nor butterfly valve, if you can get away with it. If you must have one, use a ball valve if cost or space isn’t an issue. However, if either of these things is a problem, then a butterfly valve is the only choice. 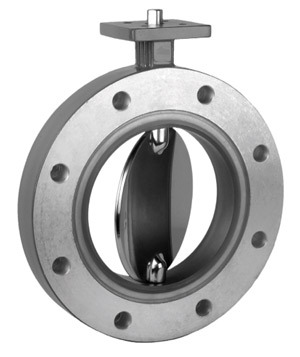 There are many applications where butterfly valves are used as pump-intake isolation valves. Large hydraulic excavators are a common example. They have multiple pumps sucking out of big tanks through large-diameter intake lines and not much space - all the ingredients that rule out the more preferred options (no valve or ball valve). I don’t recall ever seeing a pump off a large hydraulic excavator that didn’t have at least some cavitation erosion damage, which in this application could be regarded as fair wear and tear. Could this cavitation damage be attributed to turbulence caused by the butterfly valve? Sure it could, but a lot of other things may be responsible for it as well. The only way to know for certain would be to compare two pumps operating under the same conditions - one with and one without a butterfly valve installed.